I know you are probably thinking, “Come on, EVERYONE has heard of the Redcard!” Right. Exactly. BUT what my worker buddies didn’t know was that you can get a Redcard Debit card! The debit card is linked directly to your checking account and works just like your existing debit card but can only be used at Target. It saves you 5% on every purchase just like the credit card, and Target does not charge you any fees for having one! For an added bonus, you can use it at the in-store Starbucks as well. Oh yeah, baby. To really maximize the savings, partner your Redcard with the Cartwheel app. Cartwheel is a free savings program that is basically like having a slew of coupons saved in your phone. Now, Cartwheel can get you in trouble if you search through the deals before you make your shopping list because you may suddenly find all kinds of things you need. We try not to open it until we are finished with our shopping, and then we scan all the stuff in our cart to see if any the items are eligible for discounts. Cartwheel discounts are applied after Target coupons but before manufacturer’s coupons, and the 5% from the Redcard comes off last. I think the most we have saved at a time was about $10, but even when it is just $1-2 that is still money saved! Harris Teeter is one of the big grocery store chains of the southeast, and like most (all?) grocery stores, they offer a free store discount card, theirs is called the Vic card. You can use your Vic card number to sign up for eVic perks online and then receive weekly emails with further discounts only available to eVic members. We really take advantage of these perks when things like orange juice, milk or coffee are on special. Oftentimes, they have deals like buy 2 get 3 free! We don’t always need or want the things in the weekly email, but when it is something we use, we buy the maximum allowed. What if there isn’t a Harris Teeter where you live? Check your own local grocer: Publix, Bilo, Food Lion, and Safeway all have similar programs! Using the Wal-Mart Savings Catcher is pretty simple. You scan your store receipt, the app searches local competitors for advertised deals, and if a lower price is found, you get the difference. Easy, right? This app doesn’t save you as much if you only tend to buy the equate brand items as other stores, obviously, won’t be selling it, but most of your name brand items should be eligible. Only grocery, consumables, and health/beauty items count in Savings Catcher, and you can only scan up to 7 receipts each week. Tobacco, alcohol, produce and items purchased with WIC are not eligible. The payout is given in a Wal-Mart gift card. You can sign up for savings catcher here. Shopkick is an app that rewards users with “kicks” for simply walking into various stores. You can earn additional kicks by scanning certain items while shopping, making purchases and scanning your receipts. Your accumulated kicks are then used to “purchase” gift cards from various retailers. I have only ever earned kicks from walk-ins and scans because I haven’t taken the time to enter any card information to earn purchase points. I am currently sitting at 187 points out of the 500 I need to earn my first Target card. I forget to open the app when I go into stores a lot. I really need to get better at this because it is just so simple to earn rewards, and I would probably have like a million gift cards already. 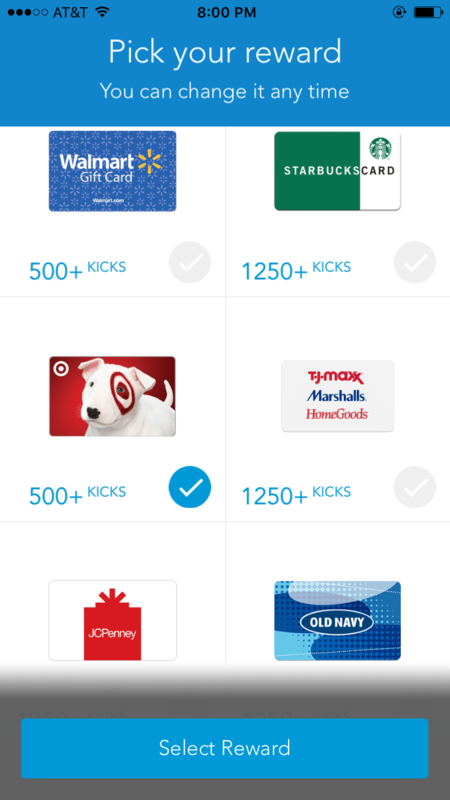 If you would like to sign up for Shopkick, it would be awesome if you would use this referral link and earn me some extra kicks. Thank you, my lovelies. This one is a bonus tip for my locals: The EatWorkPlay Axcess card is a great way to get discounts at local Charlotte businesses! I just found out about this the other day on Instagram actually. (Thank you @uptowngirlclt) I already signed up, and I am anxiously awaiting my card!!! I can’t wait to get in on all the local savings. You can sign up for your own card here. Do you use any of these apps to save money? Do you know of another one that I should check out? Well…I’m sorry that I don’t know of any programs across the pond. I’m sure there is something similar??? Thanks! It is all stuff I actually use 🙂 I hope it helps some other people save a little as well!